San Miguel Island August 30,1911. Comet (#126379) (1886-1911), 429 gross ton, 145-foot, three-masted wood-hulled lumber schooner built by the Hall Brothers in Washington for the Pacific lumber trade. She was registered out of San Francisco. 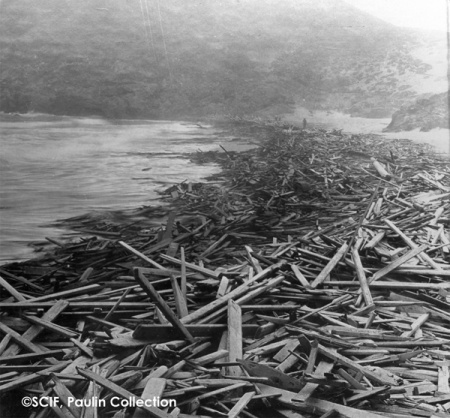 Carrying 620,000 feet of redwood lumber to San Pedro from Gray’s Harbor, Washington, she ran into Wilson Rock off San Miguel Island in a dense fog on August 30, 1911. A 24 year-old German crew member, Hans Mailborn born in Hamburg, Germany, was killed in the incident. 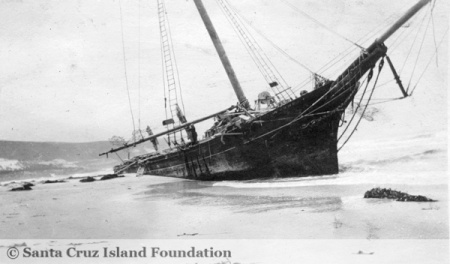 With a badly damaged hull, she drifted ashore at Simonton Cove and came to final rest. Island resident Captain Waters bought her salvage rights for $1000. As late as 1962, her hull could be seen on the beach buried in sand with only her anchor exposed. July 26, 1904 [SBMP]: “The sailing vessel Comet is expected in from Gray Harbor today with 600,000 feet of lumber for the Santa Barbara Lumber Company. This page was last edited on 16 October 2016, at 10:18.